In this post, we will discuss how to limit available dates for delivery in WooCommerce. This feature is useful for the businesses who can take advance orders only for a limited period of time. For example, If you have an online clothing shop where you can take advance orders only for next one month. And you want that only next 30 days should be available on the calendar. So you can use this feature from Order Delivery Date Pro for WooCommerce plugin. You can set limited number of dates for delivery under Order Delivery Date -> General Settings -> Date Settings. If you have online handbags shop where you want to allow only 35 dates available for advance delivery. Then you need to set the number of dates to choose to 35. Once, the number of dates to choose is set to 35, only 35 dates will be available from the current WordPress time in the delivery date calendar on the checkout page. The customers can choose the date from those dates only. 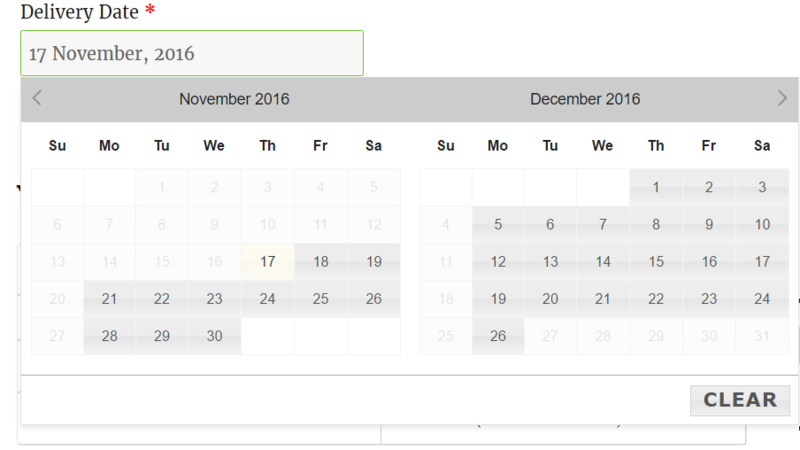 Here, the current date is 17th November 2016 as per the WordPress timezone. So, 35 dates will be available for delivery from 17th November 2016 to 26th December 2016. In this post, we saw how you can limit the number of dates available for delivery on the checkout page using a setting from the plugin. This feature is useful for almost all types of businesses.